Kokubu, H. and Lim, J. (2014). X-gal Staining on Adult Mouse Brain Sections. Bio-protocol 4(5): e1064. DOI: 10.21769/BioProtoc.1064. Ju, H., Kokubu, H., Todd, T. W., Kahle, J. J., Kim, S., Richman, R., Chirala, K., Orr, H. T., Zoghbi, H. Y. and Lim, J. (2013). Polyglutamine disease toxicity is regulated by Nemo-like kinase in spinocerebellar ataxia type 1. J Neurosci 33(22): 9328-9336. Knowing expression patterns of given proteins is very important to understand their functions. Immunostaining analysis with specific antibodies is commonly used to identify cells or tissues expressing proteins of interest. Although this technique is regularly used, it requires high quality of specific antibodies and there is no good quality of antibody available for certain proteins. Alternatively, X-gal staining is also used to analyze protein expression pattern. It is simple and routinely used to detect expression pattern of any proteins of interest in vivo. In this method, genetically modified animals that express beta-galactosidase under the control of certain regulatory elements will be used to reveal the expression pattern of proteins that use the same regulatory elements. Mouse is perfused with PBS for 5 min followed by 4% PFA/PBS for another 5 min. Mouse brain is dissected out and post-fixed with 4% PFA/PBS for 4 h at 4 °C. Fixed brain is washed with PBS three times and then incubated with 20% sucrose overnight (or until samples sink) and then 30% sucrose overnight. The brain is mounted on standard cryomold with O.C.T. compound and stored at -80 °C until usage. 40 μm cyro-section is made using cryostat and mounted on the slide-glass. Slide-glass is washed once with the staining buffer (typically 150 ml for a container) for 10 min at room temperature. Slide-glass is then incubated with 1 mg/ml X-gal in the staining buffer supplemented with 5 mM Potassium Ferricyanide and 5 mM Potassium Ferrocyanide at 37 °C until color develops. This step usually takes 3 h to overnight. Use 100-200 μl X-gal solutions per slide. Stained sample is washed with PBS three times (5 min each). Slide is dehydrated with series of ethanol (50%, 75%, 90%, 100%, 2 min each). Slide is mounted on permount and can be stored at room temperature. Sample is ready for imaging at higher magnification (Figure 1). Figure 1. X-gal staining of Nlk gene trap mouse brain. Strong beta-galactosidase expression of the Nlk gene trap mouse is observed within the Purkinje cell layer from 6-week-old Nlk gene trap mouse cerebellum. MCL, molecular cell layer. PCL, Purkinje cell layer. 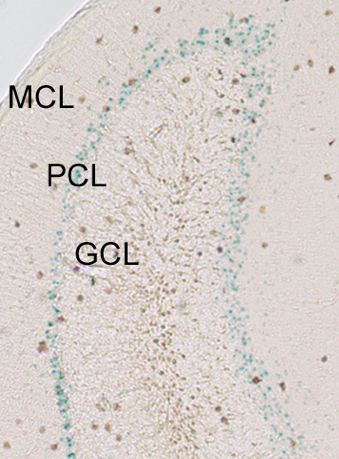 GCL, granular cell layer. The duration of incubation depends on how strongly beta-galactosidase is expressed. Sometimes it requires longer than 2 days of incubation. You can use fresh X-gal solution after overnight incubation. Wet tissue must be put in the staining container. 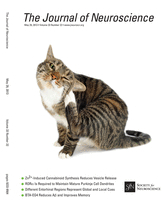 The authors would like to thank the members of the Lim Lab for feedback on this manuscript. This protocol was adapted from the previously published paper: Ju et al. (2013). This work was supported by the National Institute of Neurological Disorders and Stroke grant NS064146, the Brain and Behavior Research Foundation (Formerly NARSAD), the Alfred P. Sloan Foundation, the National Multiple Sclerosis Society, the Charles H. Hood Foundation, the National Ataxia Foundation, and the Yale Scholar Award Program to J. Lim.